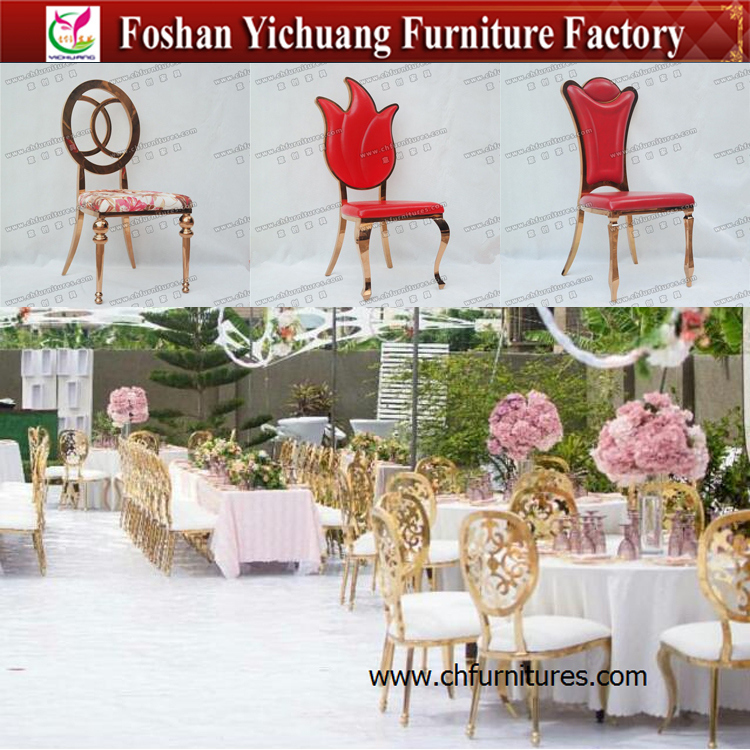 OME TO FOSHAN YICHUANG FURNITURE FACTORY! 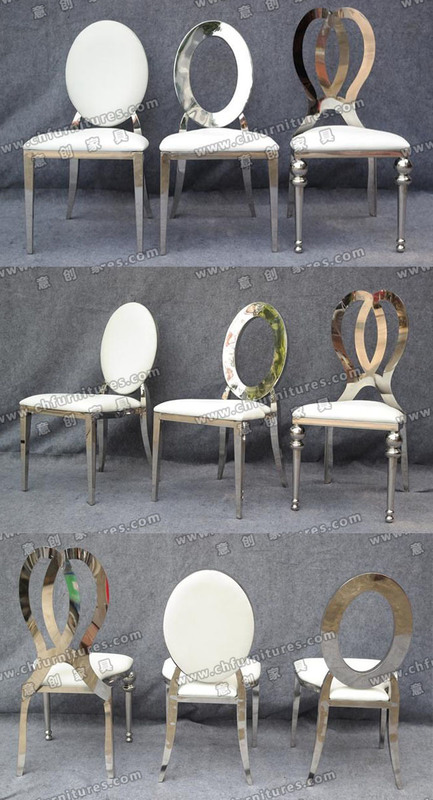 DiningÂ chairs with different angles for your reference. Chairs are stackable and durable, it is under your testing. Below is Dining Chair Detail Information. ChairÂ Size 460W*540d*505sh*1000h mm. The size can be altered according to your requirements. Finish Powder coating.Spray painting is available. Fabric White.There areÂ manyÂ fabricÂ styles and colors forÂ youÂ to choose, Â AndÂ it canÂ beÂ madeÂ fireproofÂ in UK(BS5852)orÂ US(CA117)standard.Scotchgard treatment is available. SeatÂ Â cushionÂ Comfortable high density mould sponge. StackÂ Â Â Â Â 5pcs/Stack.Stackable design to save space and shipping costs. 2.Stack the chairs in 15-17pcs in one stack. 3.Firmly lashed down with rope. Handwork Profession staff to weld and grind. Our services 1.We will get beck to you within 12 hours if you email to us. 2.The more details you provide such as model No, quantity,quality request, the better price you will get. 3.Estimated delivery may be affected by holidays. 4.If you order sample first,we will add some sample fee, but it will be returned to you once you release the order. 5.Free documents: Proforma Invoice,Packing List. 6.All the prices of the products are subject to our final confirmation. 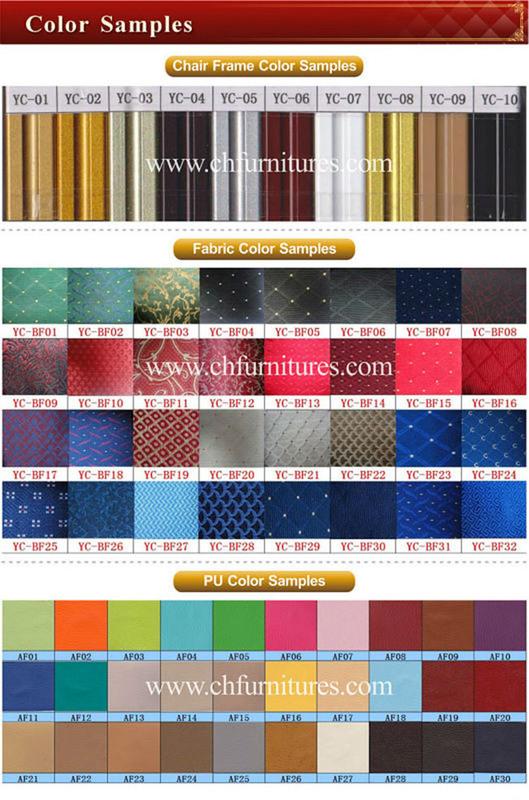 There are different tube colors and fabric colors for your choice. Please check below our Production Process.Then you will know how we do our Dining Chairs. There are many events andÂ hotelsÂ are using our chairs that looks amazing and elegant. Excellent chairs never ever make you disappointed! Every year, we participate in many different professional international Fairs to attractive more and more people. We have the professional sales team to answer your question about our product ,looking for your messages. 3.Can the sample cost be refund? When you order one container from us,we will refund you the sample cost,but can't refund you the freight cost.Hope you can understand. Please let us know the specific model number,color and quantity you want. Then we will check our stock.If all stock we have, we can send to you at once. If not, we will check the best lead time for you. 5.Will my goods in good package? Yes, of course. All the chairs in Export carton package .Don't worry about it. 6.Can show my logo in the carton? Yes, of course. Please provide your logo to us, so that we can make it in the carton. 7. I don't like your package way, can pack the chairs what i want? Yes, of course. Please let us know how you want it. Then we will try our best to reach your target. 8.Â HowÂ doesÂ yourÂ factoryÂ doÂ regardingÂ qualityÂ control? "QualityÂ isÂ priority. ''OurÂ inspectorÂ QCÂ willÂ checkÂ theÂ goodsÂ inÂ every procedureÂ andÂ modifyÂ theÂ partsÂ onceÂ theyÂ findÂ anyÂ problemsÂ fromÂ them.Â And we also will takeÂ photosÂ forÂ everyÂ procedureÂ forÂ ourÂ clientÂ to confirm. Our factory is located in Jiujiang town, Foshan City, Guangdong Province, China. It takes about 40-50 minutesÂ by car from GZ. Send your inquiry Details in the Below forÂ more information about this product,Click"Send" now!